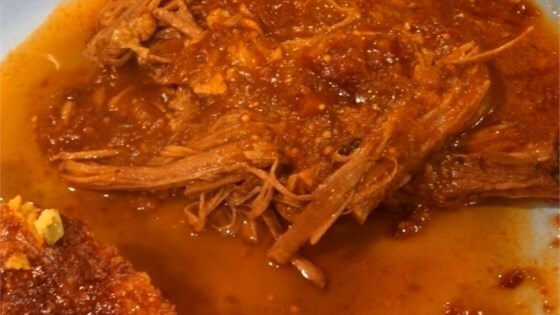 "Spicy Mexican-style beef brisket cooked in a pressure cooker. Delicious! Serve with warm corn tortillas, sliced avocado, cilantro, and black beans. " Place the tomatillos, chipotle peppers, tomato sauce, water, salt, and brown sugar in the work bowl of a food processor, and blend until smooth. Set the mixture aside. Heat the olive oil in a pressure cooker with the lid off over medium heat, and cook and stir the onion and garlic until the onions are translucent, about 3 minutes. Drop the brisket into the pressure cooker, and sear it on both sides. Pour the tomatillo mixture over the brisket, bring to a boil, and place the lid on the cooker. When the pressure comes up, set the heat so the cooker develops medium pressure, and cook for 1 hour and 15 minutes. Allow the cooker to release pressure on its own (without using the quick-release), and remove the brisket. Serve hot, with tomatillo sauce on the side. Perfectly seasoned, tender beef brisket that's a cinch to make. Delicious, but yes, it was spicy. Thanks for the warning! I used half of the can of chipotles and it was still a little spicy but we loved it. This dish is fantastic. Very spicy, easy to make, the pressure cooker makes the brisket super-tender. A family pleaser. No brisker available so we used top round and a pressure cooler. Just phenomenal!